Citizens opposed to the new gun legislation gather at the Statehouse before last Wednesday's ceremony. 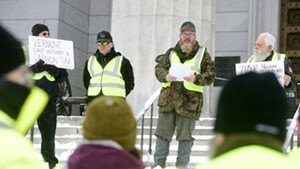 The plaintiffs — the Vermont Federation of Sportsmen’s Clubs, the Vermont State Rifle and Pistol Association, two sporting goods stores and one gun owner — are being represented by Brady Toensing, vice chair of the Vermont Republican Party, and Cooper & Kirk, a Washington, D.C., law firm that has represented the National Rifle Association in multiple cases. The law prohibits Vermonters from buying magazines with a capacity of more than 10 rounds for rifles and more than 15 rounds for handguns. The gun groups are seeking an injunction to prevent the law from being enforced while the case is argued. In a written statement, Attorney General T.J. Donovan, a Democrat who supported the new laws, said his office had anticipated the suit. "We are prepared and will vigorously defend Vermont law," he said. In a statement of his own, Republican Gov. 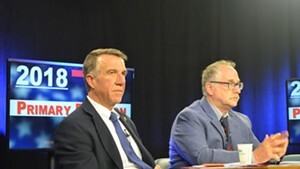 Phil Scott said, “I'm confident the new law is consistent with the Vermont Constitution and appreciate the Attorney General’s support and commitment in defending State law." The lawsuit states that the magazine ban “impermissibly burdens and infringes the fundamental right of law-abiding Vermont citizens to bear arms in their own defense,” a violation of the Vermont Constitution. Article 16 guarantees people the "right to bear arms for the defence of themselves and the State." 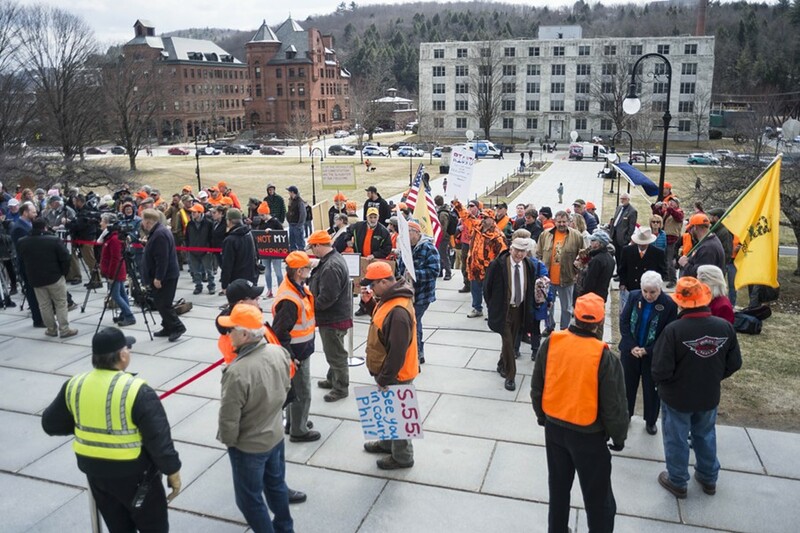 The suit further claims that magazine limits “will make law-abiding Vermont citizens more vulnerable to criminal attack by depriving them of commonly-owned ammunition magazines” — an especially “pernicious” risk given the rural nature of the state. It uses Revolutionary War hero Ethan Allen and his brother, Ira, to illustrate the state’s long tradition of using firearms “in defense of state and self,” noting that the Green Mountain Boys, led by Ethan Allen, used their own guns to lay claim to Fort Ticonderoga in 1775. Under the new law, gun stores have until October 1, 2018, to sell off existing inventory, and magazines purchased by that date will remain legal. Vermont gun manufacturers can continue to sell magazines out-of-state, an exemption Toensing helped secure, and high-capacity magazines will be permitted at gun competitions until July 1, 2019. Despite those carve-outs, the suit suggests that magazine restrictions will reduce participation in firearms competitions, harming the clubs that host them, and cause “significant financial loss” at gun stores, including the plaintiffs, Powderhorn Outdoor Sports Center in Williston and Locust Creek Outfitters in Bethel. The only individual plaintiff is Leah Stewart, who co-owns Locust Creek Outfitters and, according to the lawsuit, has an AR-15 as well as multiple handguns that use magazines with more than 10 or 15 rounds. As of Wednesday, the Sportmen’s Club had raised close to $23,000 for legal expenses on the crowd-funding site GoFundMe. 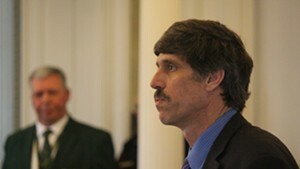 Sen. Phil Baruth (D/P-Chittenden), a longtime proponent of gun control, isn’t concerned.